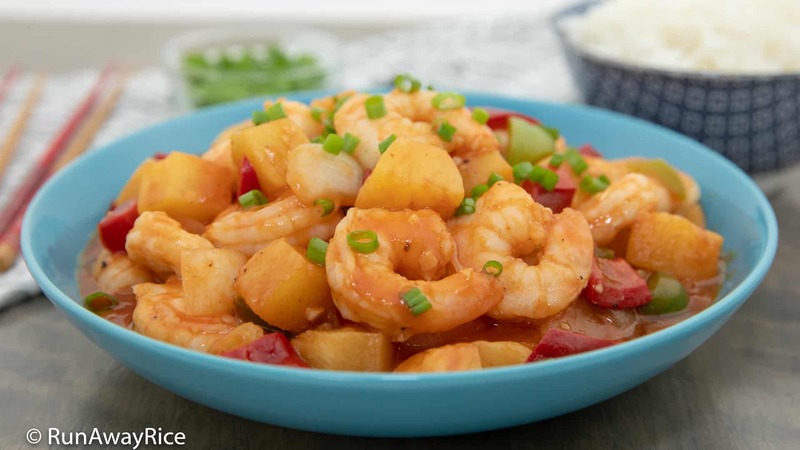 This Sweet and Sour Shrimp (Tom Xao Chua Ngot) recipe is healthy, hearty and can be made in less time than it takes to get take-out delivered to your house. Juicy shrimp, pineapples chunks and fresh vegetables are stir-fried in a homemade sauce to make this flavorful, sweet and tangy dish. The steps to make Sweet and Sour Shrimp are quick and super easy: Prep the fresh vegetables. Make the sweet and sour sauce. Stir-fry everything in one big wok. This is one pot (or wok) cooking at its best! 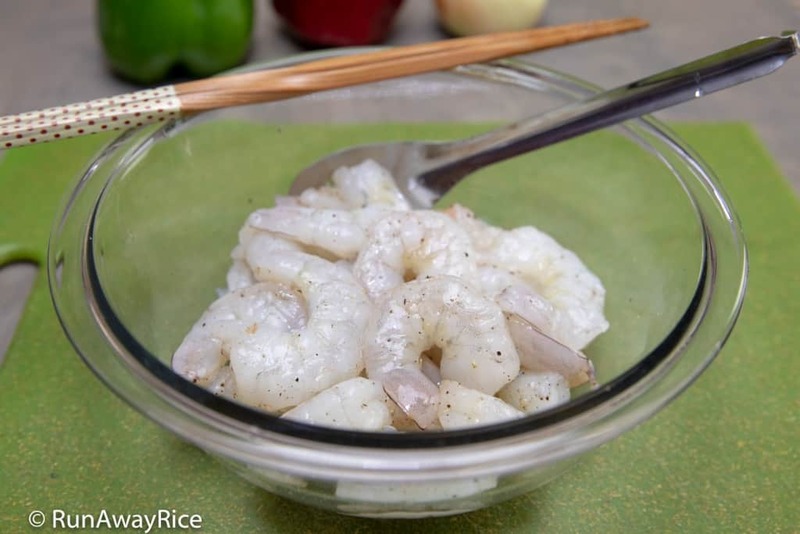 Serve the Sweet and Sour Shrimp over hot rice for a healthy and satisfying meal. Enjoy! Shrimp is sized based on the quantity/count per pound. Size 31-40 shrimp means 31 to 40 individual shrimp would weigh about 1 pound (454 grams). 31-40 shrimp is medium size and great for most recipes requiring whole or halved shrimp. For this recipe, I recommend larger shrimp like 16-20 or 21-25 as they are plumper and juicer. Also, larger shrimp is more substantial if you’re serving this Sweet and Sour Shrimp as a main course. 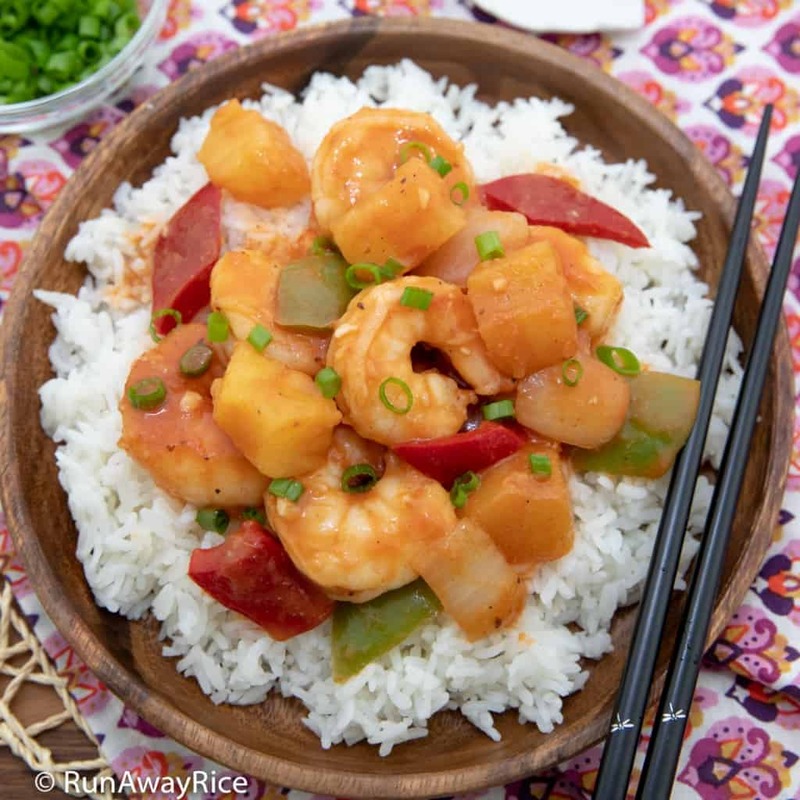 This Sweet and Sour Shrimp dish is one of my favorite busy-day meals. I always have canned pineapple chunks and tomato paste in my pantry. Using canned pineapple chunks is a big time-saver. Pineapples are delicious in stir-fries and the naturally sweet and tart pineapple juice makes an amazing sweet and sour sauce. 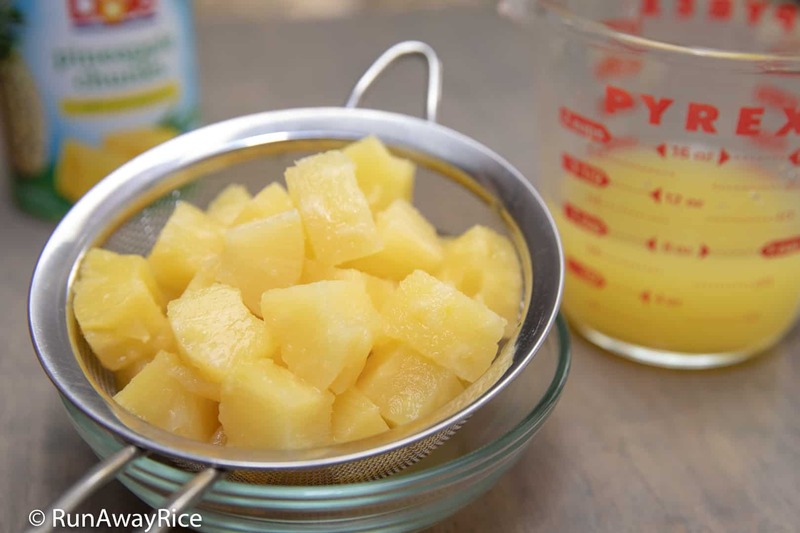 A 20 oz can of pineapple chunks yields about 12 oz pineapple chunks and 1 cup pineapple juice. 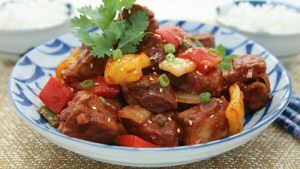 Use 3/4 cup pineapple juice to make the sweet and sour sauce. Avoid overcooking the shrimp which can cause the texture to be rubbery. Cook the shrimp until it just starts to turn pink and then add the pineapples chunks and sweet and sour sauce. The remaining cooking time will cook the shrimp fully. If you’re concerned about the timing, add the shrimp last and cook to the desired doneness. Either method works just fine! Transfer the shrimp into a medium bowl. Add a dash of salt and ground black pepper and toss together. Set aside for now. 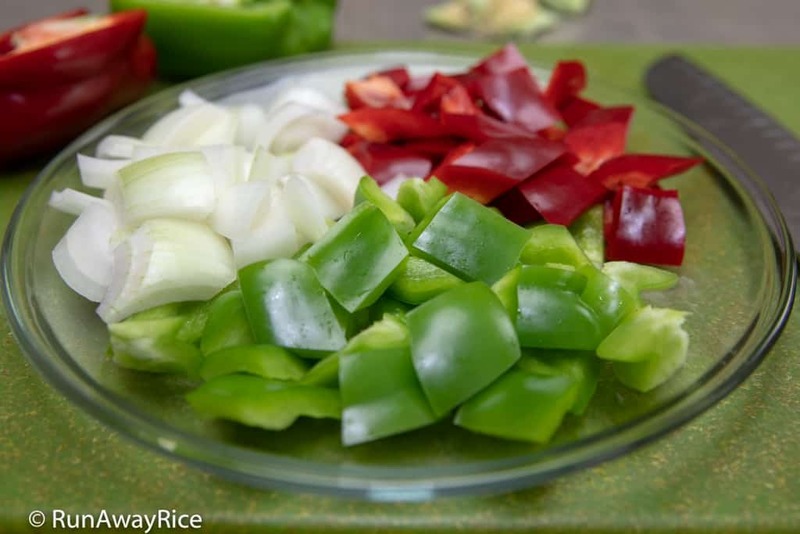 Remove the core and seeds from the green and red bell peppers. Cut into medium-sized pieces. Chop the yellow onion into chunks about the same size as the bell peppers. Transfer the canned pineapple chunks into a small strainer, separating the juice. Reserve 3/4 cup (180 ml) pineapple juice for the next steps. To the 3/4 cup (180 ml) pineapple juice, add the rice vinegar, tomato paste, sugar and corn starch. Combine until the mixture is smooth. Heat a large wok over Medium High heat and when hot add vegetable oil. Add the minced garlic and stir-fry for 10 seconds. Add the chopped bell peppers and onions and stir-fry for 2 minutes. Add 1 Tbsp water to moisten the vegetables if needed. Add the shrimp and stir-fry until it just starts to turn pink, approximately 30 seconds. Add the soy sauce and oyster sauce and combine together. 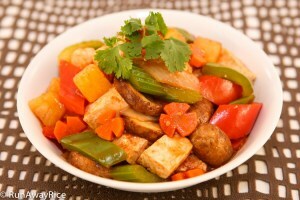 Stir the sweet and sour sauce mixture again and then drizzle over the shrimp and vegetables. Toss together coating everything evenly in the sweet and sour sauce. Cook until the sauce bubbles and thickens, approximately 2-3 more minutes. Top with more freshly ground black pepper and the chopped green onions. 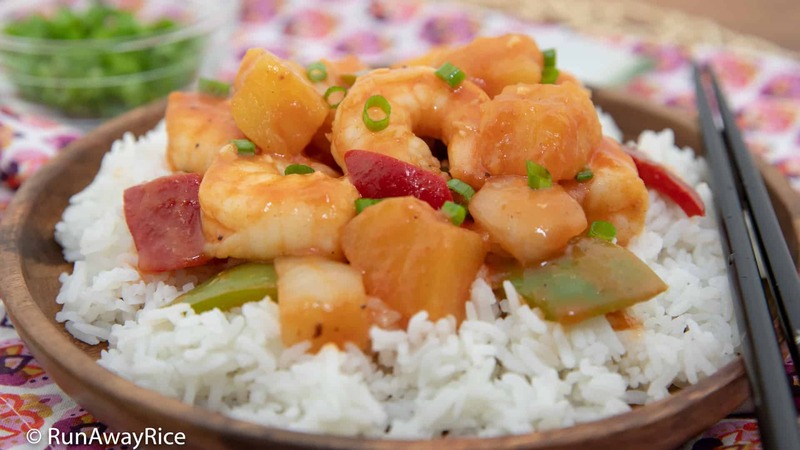 Serve the Sweet and Sour Shrimp over hot rice for a delicious and hearty meal. Refrigerate any remaining portions and enjoy within the week. Feel free to use the vegetables you like. This is the perfect dish to make when you need to clean-out the fridge. Use those leftover vegetables. Avoid overcooking the shrimp which can cause the texture to be rubbery. 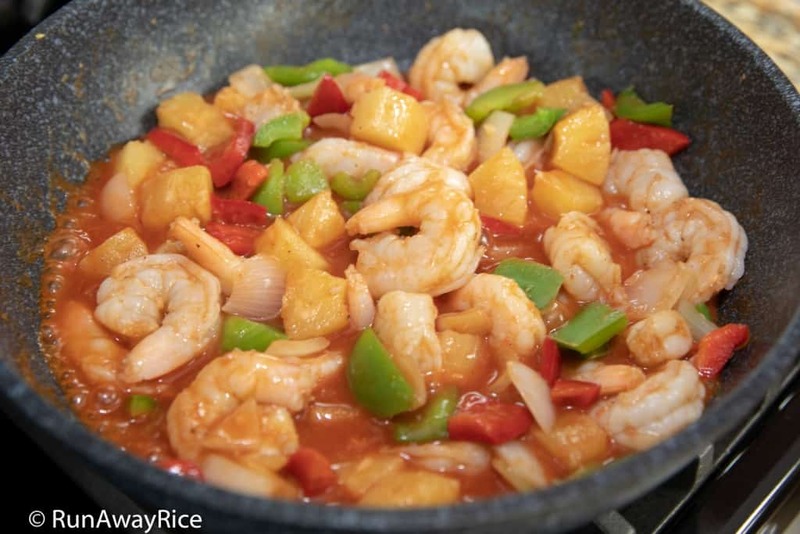 Cook the shrimp until it just starts to turn pink and then add the pineapples chunks and sweet and sour sauce. The remaining cook time will cook the shrimp fully. If you're concerned about the timing, add the shrimp last and cook to the desired doneness. Either method works just fine! Hello chi Trang, I couldn’t wait to try your recipe because it looks so healthy, no deep frying shrimp and no ketchup or lots of vinegar in the sweet and sour sauce. It turned out so yummy. Definitely a good busy day meal. It took me 18 minutes start to finish to make this, faster than my rice cooker…lol…I’ll need to start the rice earlier next time. Thank you chi for a delicious meal a busy Mom like me feels good making for her family. So glad to hear you like my recipe and found it easy to make! 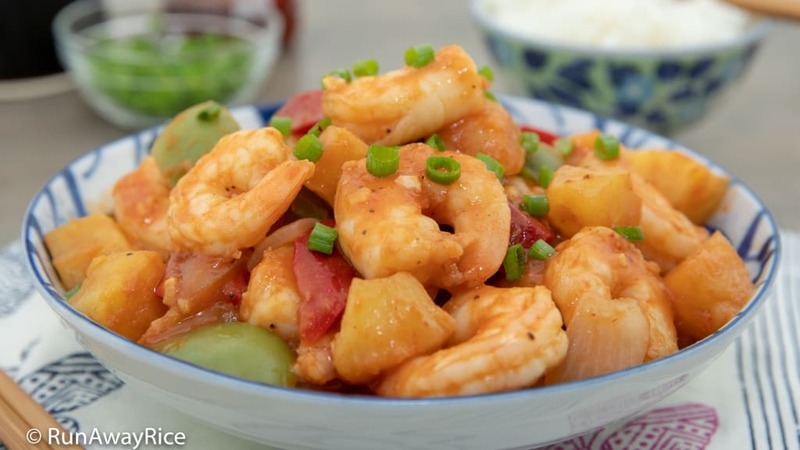 This healthy Sweet and Sour Shrimp is a favorite go-to recipe for the busy days. Thanks for stopping by! 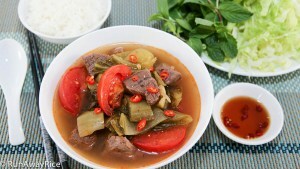 Hi Trang, so yummy I will try to cook. Thanks for posting a new one. Hope you’re doing well! Enjoy the recipe and Happy Cooking sis!